He had nothing to do and was bored. It was Game 161 on a gray day. They were giving out bobble-heads. And, the seats were $25 each on StubHub. I figured it would be easy getting in and out, etc. So, why not? By the way, they “announced” the “paid” attendance at 33,222. Boy, that’s magic. Every section was at least half empty, or more, and there were a few sections that were totally empty. What did they have, like 13,000 who bought tickets and didn’t show? Really? Anyway, what I found interesting was that the seats we had, while nice, did not give you the whole view of the field. We could not see anything in right field. Basically, any ball hit towards right that was more than 200 feet, we had to guess what happened based on the crowd reaction or the runners on base. I think those tickets go for $50 each at full price. For that amount, shouldn’t you be able to see the whole field? The New York Yankees today announced that Class of 2014 Hall of Fame Inductee Joe Torre, Hall of Famer Rich “Goose” Gossage, Tino Martinez and Paul O’Neill will all be honored with plaques in Monument Park. Torre will also have his uniform No. 6 retired. The ceremonies are part of a recognition series that will include Bernie Williams in 2015. Martinez and Gossage will be celebrated during Old-Timers’ Day weekend on Saturday, June 21, and Sunday, June 22, respectively. O’Neill’s ceremony will take place on Saturday, August 9, while Torre will take his place in Monument Park on Saturday, August 23. Tino Martinez gets a plaque? Does Willie Randolph have one? How does Tino get one before Willow? In the book, written with New York Daily News reporter Wayne Coffey, [Mariano] Rivera also says there has been a decrease in atmosphere at New York home games following the move to new Yankee Stadium for the 2009 season. Are those really Mo’s words? Seriously? And, I sort of miss all the empty blue seats too. But, those may be coming soon to the new Stadium. The vote was 47-0, with two abstentions (from councilmembers representing Manhattan and Queens). The City Council’s majority leader is named Joel Rivera and he represents the Bronx, but that’s likely a pure coincidence. I am a total Mariano fan. But, this is stupid. Man, these are some beautiful photos! Thousands of Yankees fans were angered Tuesday night when a late shipment of Mariano Rivera bobbleheads led to confusion and long, long lines to redeem vouchers for the tardy giveaway. But some reportedly didn’t have to miss a single pitch. Witnesses told the New York Post that fans “in the priciest seats” had their Mo bobbleheads hand-delivered by Yankee Stadium employees. Am I shocked by this? Not at all. Leave it to the Yankees to screw up something as simple as a bobble head giveaway. Those coming to Yankee Stadium usually must sit through several innings to see if Mariano Rivera will pitch, but fans also had to wait a few extra hours and withstand chaotically long lines Tuesday night to receive a bobblehead doll of baseball’s retiring all-time saves leader. Rivera was feted with a lavish retirement ceremony Sunday, including Metallica performing the 13-time All-Star’s signature song, “Enter Sandman.” The celebration was to continue Tuesday with the first 18,000 fans in attendance at the Yanks’ game against Tampa Bay slated to receive a commemorative Rivera bobblehead doll. But the giveaways hadn’t arrived at the Stadium when the gates were slated to open at 5 p.m., as thousands of fans queued up outside. The gates opened more than 30 minutes later than usual, and the Yankees handed out vouchers instead. An announcement was made during the middle of the third inning that vouchers could be redeemed from that point until 30 minutes after the game. And The Yankees Said 42,420 Were There Today? A comfortable Saturday afternoon for attending a baseball game in the Bronx. The Yankees were hosting the defending World Champion San Francisco Giants – while the New York Club is in “must win” mode during game #155 of their 2013 season…fighting to somehow attain a post-season berth (via the wildcard). Also, it’s a giveaway day at Yankee Stadium where guests 14 and younger were to receive a Limited-Edition TY® Beanie Buddy® named “Closer” in honor of Mariano Rivera presented by DKNY. How many people were there? According to the Yankees, there were 42,420 attending the game. Am I the only seeing a lot of empty blue seats out there today? Think Yankees COO Lonn Trost was checking them out too? Legends Suites Comforts Better Than Seeing A Ballgame Live Extremely Close? The Only #’s That May Get Yanks Ownership Attention? At dusk on the first day of summer at Yankee Stadium, there was a gentle breeze blowing to left field as a rim of fading sunlight marched across the bleachers in right. It was, in every respect, a sweet Friday night for baseball, with the Yankees taking on a formidable division rival, the Tampa Bay Rays. The only thing wrong with the picture was the number of empty seats that remained visible in the stands as the game progressed — and the missing names from the Yankees’ lineup. The attendance for the game was announced as being slightly more than 41,000, or about 9,000 short of capacity. That was a solid number for a regular-season game but not as robust as it might have been in other seasons in the Bronx, where the Yankees usually reign as the most distinguished name in American sports. The Yankees do not fit in any of those categories, which makes their attendance falloff more intriguing. And while they also experienced a decrease in attendance the last two years, the one this season is more pronounced. Even more sobering for the team: the television ratings for their games have plummeted. Through June 25, the ratings on their YES Network were down 40 percent to 2.52 from 4.17 at this point last season, and from 4.08, 4.50 and 4.72 in the three previous seasons, with each rating point this year representing 73,843 households. Yet the sizable drop in the number of people watching the Yankees is not reflected by the team’s performance. Battered by injuries to many of their stars, they have, for the most part, played admirably, holding on to first place until late May. Even now, while in a slump, they remain in contention with a lineup filled with castoffs and call-ups, although that could be a reason fewer people are paying attention. For now, it is left to Levine, the forceful team president, to argue that whatever the ratings and attendance figures show, there is no cause for alarm. He has presided as the Yankees’ president for the last 13 ½ years, a period in which the team’s attendance soared to more than four million for four straight seasons, then leveled off when the newer, smaller, higher-priced stadium opened during the recession. Last fall the Yankees failed to sell out several playoff games, although that was generally attributed to the fact that the team had to play five postseason games in a row at home, without a day off, leaving fans overwhelmed. In addressing the current numbers, Levine noted the numerous instances of bad weather in April and May, the attendance drop-offs in baseball-strong cities like Boston and Philadelphia, and the Yankees’ decision to spurn StubHub and establish their own online ticket resale operation with Ticketmaster. The move was intended to encourage fans to buy more tickets directly from the Yankees, and Levine said it was paying dividends but that the initial adjustment might have hurt attendance. As for the larger point, the need for big names in the Bronx, he seemed as confident as Jeter normally is before a big at-bat. But not just yet. And when the Yankees return home Friday to begin a 10-day homestand that will carry them into the All-Star Game break, there may still be a noticeable number of empty seats at Yankee Stadium and too few viewers turning on the TV. In every respect, it has been an unusual season in the Bronx. The only interesting part left to this is finding out who will be the fall guy amongst the Yankees front office. It looks like singing the anthem down in Trenton earlier this year, for the Yankees Double-A club, was warm-up gig for 14-year old Grace Cashman. The daughter of Yankees G.M. Brian Cashman sang the National Anthem before this evening’s game at Yankee Stadium too. The Yankees broadcast on the YES Network made a semi-big deal out of her singing the anthem – as if getting the nod to sing was a major achievement. Can the girl sing? Sure…maybe…I dunno? But, isn’t it a tad of a joke to imply that she was given the chance to sing the anthem solely because of her talent? I mean…if little Susie Lipschitz-Doofenshmirtz of Mill Basin could sing the phone book and make it sound like Patsy Cline in your ear, would she get a shot to sing at Yankee Stadium if she wanted to…and raised her hand? Doubt it. [Hal] Steinbrenner is also optimistic the attendance at Yankee Stadium would increase in the coming months. They have averaged 37,461 fans per game heading into Saturday, according to ESPN.com. The team averaged 43,733 fans in 2012. “I still think the economy is not good, despite what some people might say,” he said. “A lot of people are struggling out there, and we understand it. …but, will they be lining up to buy Reid Brignac jereys? Is Anyone Going To Yankees Games These Days? 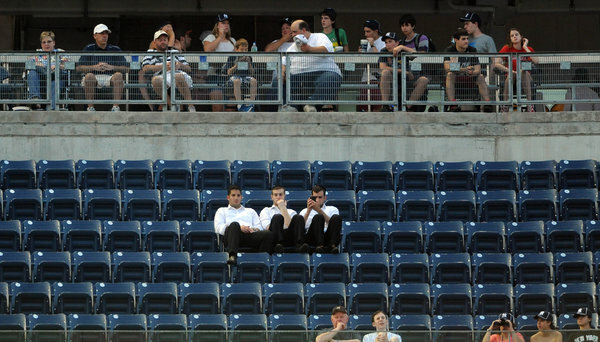 Per @baseball_ref, Yankees attendance down 3,634 per game compared to this time last year. That’s a lot. Mets down 453 per game. A friend of mine, who lives about 40 miles southwest of Yankee Stadium, in New Jersey, went to the game yesterday via car. He said that it usually takes him about an hour, give or take, in typical traffic. But, yesterday, he said, door-to-door, it was only 36 minutes – which is an all-time record for him. It was Sunday. Beautiful, if not perfect, weather for baseball. And, it was a 1 PM start. Per the Yankees, there were 36,872 attending the game. But, how many do you think were really there? For the record, I had an extended conversation with Brian Richards before Game 5 of the 2013 ALDS, and, you would be hard pressed to meet a nicer guy. Super, super, dude.